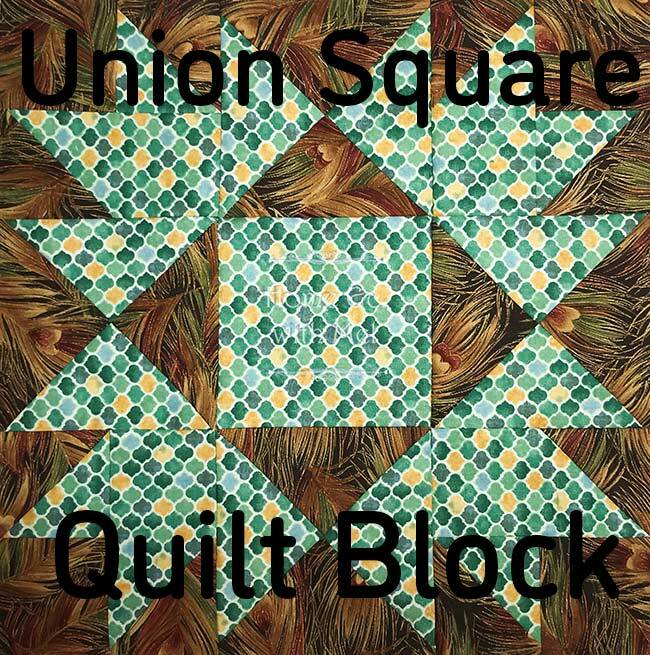 I'm so excited to share the Union Square quilt block with all of you. This whole project put a lot of things in focus for me. It made me realize that everything happens for a reason and you have to roll with the punches. This is not my design, I'm collaborating with Fat Quarter Shop. It's been a while since I've made someone else's block which was nice. The Union Square block takes just two fabrics and if you don't want to pick fabrics Fat Quarter Shop is offering a kit. This whole thing started with a missed email. Fat Quarter Shop had sent out an email seeing if anyone wanted to collaborate with them and it went to my spam folder. I was bummed because I really wanted to work with them. A few days later I got another email from them with this project and I jumped on the chance to do the Union Square quilt along with them. I picked out my fabrics, tested them with my "tried and true" method to make sure I had a light and a dark, and proceeded to put the block together. I miss read the deadline and when I didn't like the block I couldn't remake it because I didn't have the time. The larger scale print I used lost its contrast when I cut it up, the block didn't look like me, and I felt like I failed. Thanks to a delay in Fat Quarter Shop getting the fabric for their kits I was able to remake my Union Square block and I'm thrilled with my final block. 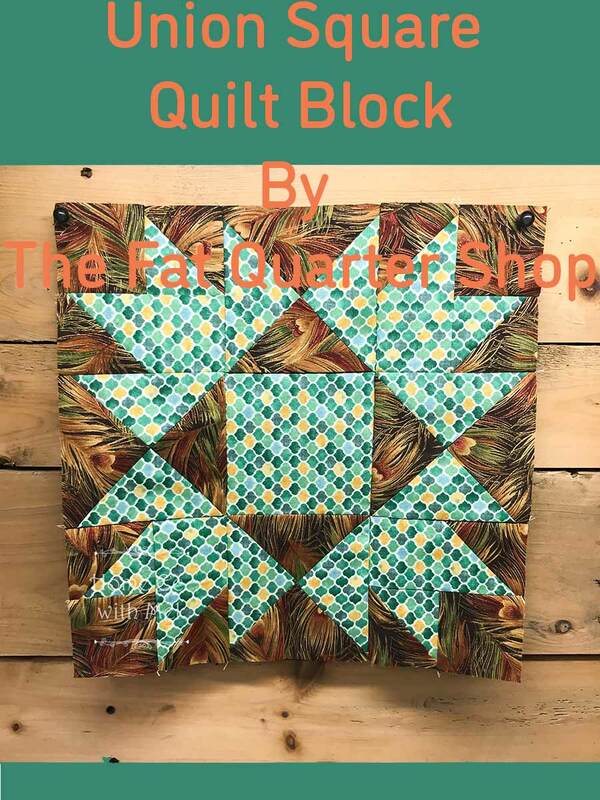 The block pattern is a free download from Fat Quarter Shop. The theme for this quilt along was vintage and classic. I used a vintage print from Hoffman, it's the dark brown. It has kind of a peacock design in it. Peacock is back in fashion proving if you wait long enough everything cycles around again. The green is a print from my friends at QT, Arabesque Tonal Geometric Teal Fabric. I like mixing new fabrics and older ones from my stash because it gives the block a classic feel but still modern. It is a super quick block to put together. I put my second one together in about an hour. 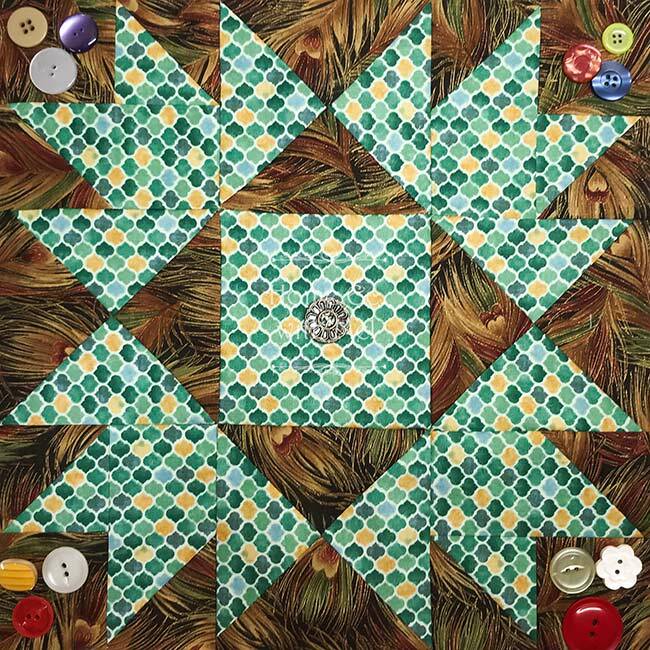 I know you guys like video tutorials and Fat Quarter Shop has a video tutorial of the Union Square quilt block on their blog. I really suggest that you use a small print for this block. Large prints get lost and so does the design of the block. If you like the block they have a quilt pattern available. The pattern has crib, lap, twin, and queen sizes. It is a digital download so you don't have to wait for the pattern to get to you. They also have a quilt kit available, backing to match the kit, and the fabric they used in their quilt.